With business steadily increasing over the last couple of years, American Audio Visual continues to add advanced equipment, staff and partnerships, which allows the company to drive the design aesthetic of each of its events along with offering the latest in audiovisual. While AAV offers equipment rental, it also handles event design, including set pieces, backdrops and decorative stage elements. The company can integrate its own expertise and technology with that of the client’s creative team so all screens and audiovisual elements are seamless within the production and set. AAV’s staff offers expertise in live sound, theater, DJ work, musical performance and set dressing in addition to understanding the latest in audiovisual equipment. This expansive background allows AAV to support all facets of an event and provide expert operation of the audiovisual components. From designer corporate events and galas to Mardi Gras balls and concerts, AAV handles events of all sizes. The company’s client roster boasts well known names from all across the Gulf South, such as the Baton Rouge River Center, LSU, YMCA, Tiger Athletic Foundation, Pennington Biomedical Research Foundation and, of course, numerous Mardi Gras krewes. Meanwhile, the company stays on top of the latest innovations and continues to upgrade its equipment by investing in new display technology, cameras, switchers, event support gear and more. Less noticeable, but equally important, is AAV’s dedication to the principles of efficiency—from making its offices more energy-efficient, to replacing lights with LEDs, to updating its vehicle fleet for better gas mileage. “Even in the process of load-in and load-out for an event, we’re mindful of efficiencies and how they impact our client’s dollar,” says Arieux. Carter Event Management has had the pleasure of working with American Audio Visual for many years. The events we produce require effective audio and video components to complete the intended experience. It is essential that we work with experts in the audio-visual field. American Audio Visual is that company. In our experience, there is no other company in the area that provides consistent, high-quality, customer-service oriented products and service. Their attention to detail, sincere attempts to provide the proper equipment economically and within the client’s budget and their involvement before, during and after the event sets them apart. American Audio Visual is an integral part of the Carter Event Management team. Their years of experience in audio/visual and their business style provide a consistently excellent experience for both the seasoned event manager and the novice. Carter Event Management appreciates the quality they bring to our events. As always your team comes through like a champ! The seminar was a success, and of course your team’s participation was essential to that. For nearly twenty years American AV has supplied AV support and courtroom presentations for my company and its clients. Their work and professionalism is unequaled. The work we do requires the highest level of service and expertise, there is never room for a mistake or a misstep and there never has been with AAV. I fully trust them. It is a pleasure to work with them and they have always been there for me and my clients. In the 8 years that I have worked with AAV, the relationship has grown to a true partnership. They work hand in hand with us to make sure our events are planned and run smoothly. From lighting, to sound, to calling the show, I can always count on thoughtful input and work with the knowledge that they are truly invested in producing a quality show each and every time. You aren’t just hiring someone to plug in a microphone and lights, you get a partner in making sure your event goes off flawlessly. 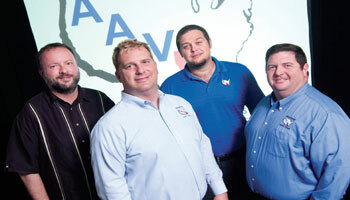 AAV will do everything they can to make sure their customers feel like they are family and truly valued by the company!